NEW YORK (CNN) -- Less than a month after an unannounced government-sanctioned lower-Manhattan flyover frightened New Yorkers, the Federal Aviation Administration turned down a U.S. Navy unit's request to fly a military plane 3,000 feet over the Hudson River in New York on Monday morning. A 747 flyover of New York for a photo shoot caused a scare late last month. In a statement, Jim Peterson, a spokesman for the FAA, said that after receiving the Navy's request to fly a P-3 patrol aircraft over the area, the FAA notified the New York mayor's office. 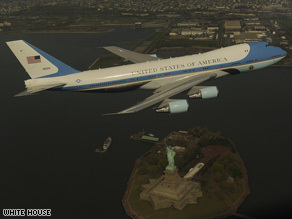 A spokesman for the mayor's office said that after the April 27 Air Force One flight for a photo session, a new notification procedure was instituted for potential flyovers. "We were notified by the FAA this morning," said Jason Post of Mayor Michael Bloomberg's office. "We told the FAA we didn't think there was enough notice given, and then the FAA -- on their own -- made the decision to cancel the flight," Post said, adding that the city itself does not have the authority to tell the FAA to cancel a flyover but can make recommendations to the agency. Peterson said, "When higher-level FAA officials learned about the request, they informed the Navy that the flight was not approved and would not be allowed to fly the requested route." Navy spokesman Cappy Surette said later that a P-3 squadron based in Brunswick, Maine, had planned to fly in a training exercise. Surette explained that more than two dozen such Navy training flights have occurred over the Hudson since 2005. "It allows the squadron to practice complex air-traffic handoffs in a busy quadrant," he said. "The request was made; they said 'Not this time'; we said 'OK,' " Surette added. On Thursday, President Obama accepted the resignation of Louis Caldera, the director of the White House Military Office responsible for the controversial low-altitude flyover of New York by a 747 used as Air Force One. The flyover, officials said, was both a training mission and a government-sanctioned photo shoot. Military officials estimated that the mission and the photo shoot, aimed at updating file photos of Air Force One, cost $328,835 in taxpayer money. The low-flying plane, accompanied by an F-16 fighter jet, sent some New Yorkers into the streets and into a panic, amid memories of the September 11 attacks on the city. Building evacuations also took place across the Hudson River in Jersey City, New Jersey.